I have been making money via Amazon Associate program for the past six months. 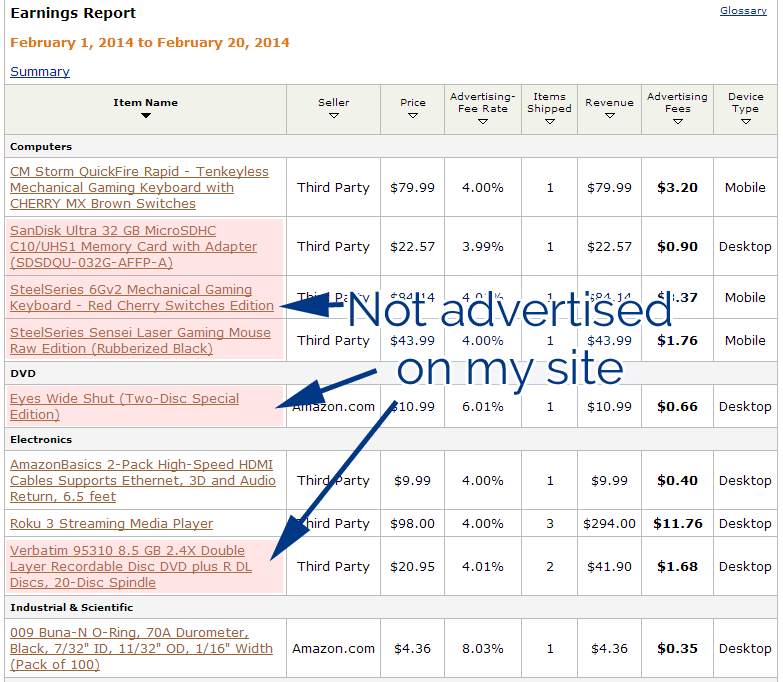 It pays better than showing ads on my blog. When visitors come to my post by searching on Google, they are already interested in knowing more about a product. I merely presents the facts and my opinions, letting them make their own decision. If they decide to buy, they click on my Amazon Associate product link and I earn a referral fee. In this post, I will show you how it is done. If you are already a master at this, share some tips in the comments below. Referral Rate: How much you can earn? Let's see how much you can really earn first. For each product that is sold through you and shipped out, it is considered one successful referral. Amazon Associate has a progressive referral rate table. The more item you sell, the higher the incentive. You should aim to hit the 6% tier by selling at least 7 items each month. The nice thing about this incentive is that, when you go into the next tier, the item in the previous tier upgrades to the higher rate, giving you an additional bump in earnings. Rates accurate at the time of writing this blog. The average cost per item that I have sold so far is around USD $50 and I am in the 6% tier. That works out to be $3 earnings per sale. In a month, I make an average of USD $50. That pays for some of my lunch and coffee. *Note that electronics referral rate is capped at 4% no matter how many items you sell. You conversion rate determines how much you can earn each month. When someone visits your web page and eventually make a purchase through your referral, that is counted as one conversion. If 10 visitors visit your web page and 1 makes a purchase, that is a 10% conversion rate. The entire process of getting visitors to buy can be viewed as a conversion funnel that can be tweaked along the way. Once the visitors get to Amazon, let them do the hard work. From my experience, Amazon is an expert in converting customer with a conversion rate of 10% for the products I put up. Your focus should be funneling visitors to the products they are looking for. These visitors may end up buying other items which still earns you money (more on this in the Earnings Report section). A domain name that is easy to remember, sounds interesting or related to what you want to promote. You can buy your domain name from Godaddy.com which offers domain names cheaply. I have been using them for 8 years now. A web server to host your web content. This can be on Blogger, Wordpress or a web hosting company. I use blogger as it is free and meets my needs. Open an Amazon Associate account. It's even easier if you already have an Amazon account as it is just a matter of using your Amazon login. 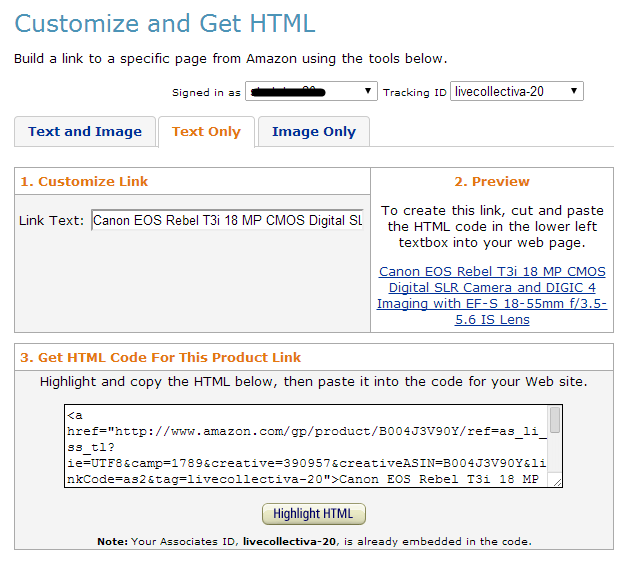 The easiest way to generate referral link is using the site stripe on Amazon.com. When you have an active associate account, you will see a black bar at the top of Amazon. Browse to the product that you want to promote and click on Link to this page. There will be a pop up box allowing you choose between Text and Image, Text Only and Image Only HTML codes. The links that has your Tracking ID inserted automatically. I usually go for Text Only links because it is less distracting for the users and it has a higher conversion rate based on my testing. Visitors tend to associate product pictures as Ads. Have you visited a page where it is plastered with Ads images within the contents itself, making it utterly confusing what you are suppose to look at? The Tracking ID field is a useful way to track how your users are coming in. You can use the same Amazon account for multiple websites and using a different Tracking ID lets you track which site is generating the sales for you. 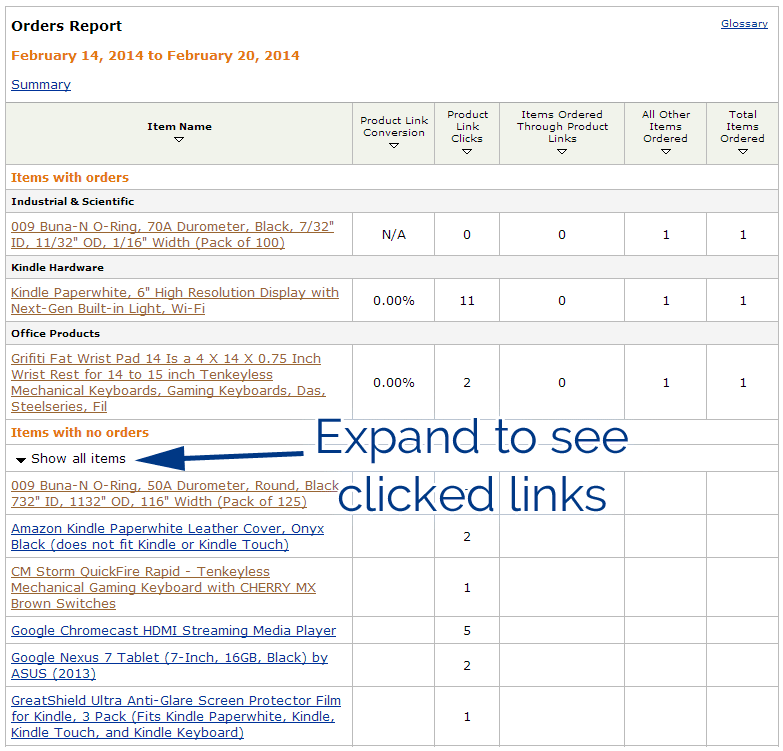 Once you get Amazon Associate account up and visitors are clicking on your links, you will see their activities in your Orders Report. The reports are updated daily after 8pm Singapore Time and may have delays up to 2 hours during busy period. The orders report shows you the items that visitors have paid for. There is also a section titled "Items with no orders". When you click on the white arrow of "Show all items", it expands out to show the links that your site visitors have clicked. This is important when you want to know if your visitors clicks are getting registered to your Amazon Associate account. The earnings report shows you the items that have shipped out and what you earn is reflected in the Advertising Fees column. Items that are shipped out can be returned and those shows up as negatively deductions on your earnings. If you look at the items that were bought below, many items are not what I advertised on my blog. When a visitor clicks on your link to reach Amazon, a 24 hour cookie is placed on their computer. Any items that is bought within this 24-hour period is counted as your referral. A visitor after reading my review on the CM Storm QuickFire keyboard may decide that the SteelSeries mechanical keyboard meets his requirement better and that is fine too. Not all items are ordered and shipped will earn you an advertising fee. I had items like baby milk bottles, shoes and bluetooth headset that were ordered but never credited to my account. From what I understand, these merchant list their items on Amazon and use their delivery system to ship their items. Hence, Amazon is unable to pay out on for their items. On the 2nd of each month, the earnings from the month before is paid out to you. For example, the earnings in December 2013 is paid out in 2 February 2014. If your Unpaid Balance has not reached your minimum payment threshold, it accumulates until the next month. You can set the minimum payment threshold in the payment method screen. The minimum payment threshold applies only to payment by check. The fastest way to cash out is to get paid by Amazon.com gift card that can be immediately used to offset your Amazon purchase. I have set my minimum payment threshold to $200 which I am hoping to reach by May. It's not a lot but at least it's something to look forward to. I will post my check when I get them. If you were unsure if you can make money via Amazon Associate, I have shown you that it is possible. There are many success stories out there. You should read this The Ultimate Guide to Making Money with the Amazon Affiliate Program by Darren Rowse to learn more tips. This is no magic bullet to making money, it just needs time and effort. In my next post, I will show you how to earn from referring with Qoo10.sg.